By admin | March 6, 2012. There is a number of Irish-themed events in store for the Liberties area, and around the city, as part of the Saint Patrick’s Day festival which is on from Friday 16th to Monday 19th of March. It will kick off on the Friday with an outdoor Céilí in Stephen’s Green. Expert callers, dancers and musicians will be there to guide the participators and teach beginners the steps. A selection of the imaginative and creative science projects sent in from schools around the country will be showcased on the live parade coverage, which will be viewed by over 395,000 people. Local schools in the Liberties will be doing their part in the Saint Patrick festivities by taking part in Seachtain na Gaeilge. This encourages students to speak Irish and host their own Céilís. A number of the local pubs will be embracing the celebrations with table quizzes and special Paddy’s Day drinks, including apple martinis and lime green cocktails. Around the corner at the Guinness Storehouse they will mark the day by trying to break the Guinness World Record and make Saint Patrick’s Day the friendliest day of the year. 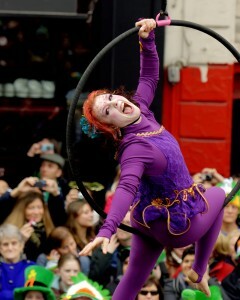 On Sunday March 18th The Festival Big Day Out will take place in Merrion Square with street performances, theatrics and workshops. Then on Monday Discovering Science host a science themed treasure hunt through some of Dublin’s landmark buildings and venues.